Thanks in part to numerous stories, books and a couple of films about the unsolved 1947 murder mystery of aspiring actress Elizabeth Short, dubbed by sensational media as the “Black Dahlia,” the decades old gruesome murder continues to intrigue and capture people’s imagination. Patty Jenkins is the latest to revisit the mystery with “I Am the Night,” a six-episode limited series which premiered its pilot episode on TNT on Monday, with the rest set to air on succeeding Mondays. The series features a wide-eyed 16-year old schoolgirl Fauna Hodel (played by India Eisley) who, grappling with her mixed-race identity and struggling with her relationship with her alcoholic adoptive mother, decides to travel to Los Angeles in search for her elusive birth mother. 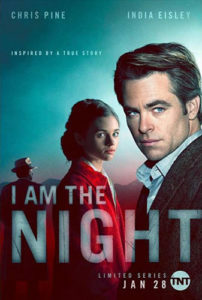 Chris Pine is Jay Singletary, a disgraced, drug-addicted journalist haunted by his past and literally at the end of his rope, and whose path changes after receiving an anonymous phone call. It took a while for the story to take hold, initially building Jay’s character and Fauna’s biracial background, both depicting the 60s’ rough racial and social relations at school and in the neighborhood. But when the two finally meet, the story takes off into high gear while spinning around the fascinating mysteries of the Black Dahlia murder. Pine is the big name draw of the show and it’s easy to see why. He is always intense in everything he does. When the guys dragged him out of the Los Angeles County coroner, he maniacally laughs it all off as he is beaten to a pulp. He’s a naturally talented and effective actor and he carries the series on his shoulders effortlessly from the very first episode to the last. Credit goes to Jenkin’s solid and creative direction, taking us into a foreboding yet alluring trip of that era in Los Angeles. Here, she goes back to a medium that allows her to flesh out the density of the story into multiple episodes. It’s interesting to note that Jenkins’ move to TV after a hugely successful film has precedent. In 2004, she directed an episode of “Arrested Development” (“The One Where They Build a House”) in its second season right after her award-winning film “Monster” put her on top of Hollywood. It helps that Pine and Jenkins have worked together incredibly well before, in the acclaimed superhero blockbuster Wonder Woman, and their chemistry paid off here as well. Jenkins directed the pilot and second episodes while Victoria Mahoney directed the third and fourth episodes. The series is written by Jenkins husband Sam Sheridan. This entry was posted in Entertainment, Movies, TV by admin. Bookmark the permalink.